A flat coastal procession past white sandy beaches and inviting bays but it’s all a warm up for the double ascension of the Puig Llorença with its double-digit gradients and another Made-For-TV stage finish. 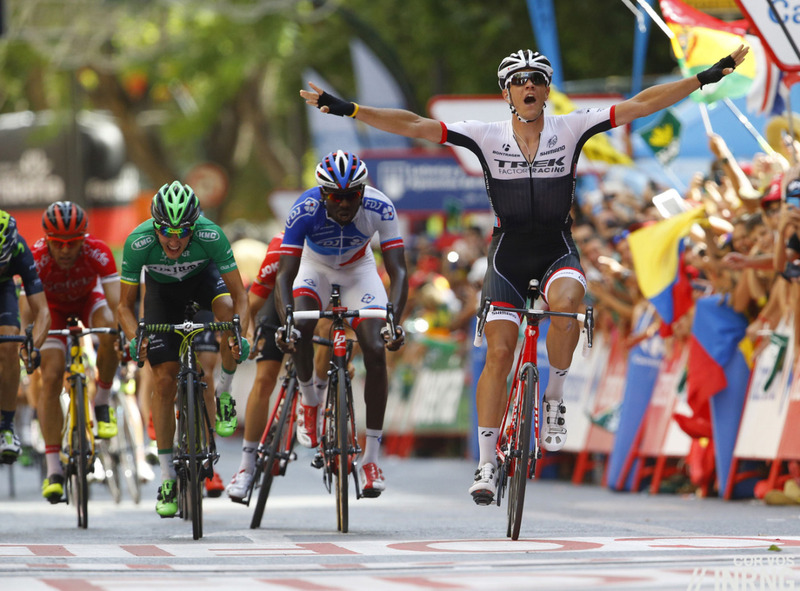 Stage 8 Wrap: the stage win to Jasper Stuyven. Once cited as the new Boonen – these labels weigh as much as rucksack full of bricks – he’s been serving his apprenticeships in the spring classics and the Cresta del Gallo wasn’t his kind of terrain. But never give up and the 23 year old made it over top of the climb at the back of the group and just closed the gap over the top and hid in the bunch before a clever ride in the finish, positioning himself on the right wheels and riding steady when others were surging before launching his sprint. The day was marked by a crashes too. A big one took out Dan Martin, Tejay van Garderen and Nacer Bouhanni and many others with Kris Boeckmans being placed in an artificial coma after suffering many injuries including a brain injury. A late moto manoeuvre sent Peter Sagan flying when he was in contention for a stage win, earning him a fine after he lashed out with punches and kicks to his bike, the race medical car and more. The Route: another stage where it’s all about the finish. We could criticise the race for the way the action is concentrated so late but it’s good to have this kind of action in the first place. It does however ensure a 120km warm-up procession to the day’s difficulty, the Puig Llorença, 3.3km at 8.9% but crucially with some steep 15% sections. The race graphic above says 19% but this seems to be a Mandelbrot moment (coastlines and all that) and the slope is more 15% on the steep parts. Either way it’s enough to rob momentum and make it a very hard climb. The Finish: the climb up the Puig Llorença again but with the final 750m they fork left on a new road to the finish line, 4.1km at 8.9% and the stretch to the finish line includes more double-digit gradients including a reported 26% section. They’ll be catching the riders across the line. The Contenders: what about Esteban Chaves? If he’s got that light smile he’s also looking so easy on the bike and this time he need only match everyone before El Chavito pounces with 100m to go. The more dependable choice is Joaquim Rodriguez who seems to be looking better and better in the race and this kind of steep finish is made for him. Team mate Dani Moreno didn’t look so hot on Friday’s summit finish but could feature. Alejandro Valverde is an obvious pick too. Fabio Aru and Rafał Majka complete the first wave of candidates but these two look safer picks for longer mountain passes. Domenico Pozzovivo, Nicolas Roche, Mikel Landa, Louis Meintjes and Nairo Quintana are all featuring in this race but not looking so threatening for the stage win yet. Can a breakaway stay away? It’ll be hard with Katusha, Movistar and others leading the chase across benign terrain and there’s the paradox of a breakaway needing to be powered by some big rouleurs to stay away but the finish suits a pure climber, why would a large rider try a move if they’re going to get worked over. Still in the all rounder category we have riders like Steven Cummings who we know is on form. Weather: warm with a top temperature of 32°C and a few clouds. TV: the first climb up the Puig Llorença is at 4.40pm Euro time and the finish is 5.40pm. It’s on Eurosport and you can rely on Cyclingfans and steephill.tv for links to feeds and streams. Daily Díaz: Welcome to the Costa Blanca, the White Coast! A traditional tourist destination both for Spaniards and foreigners, its resources are a mild climate all year long, different types of coastline, low ­to­ medium difficulty mountain hiking routes, some protected natural spaces, cultural heritage dating back to the BC era, and m​olta festa​ (a lot of party). You can practise several kinds of tourism, but of course the s​ol y playa ​is the most popular one. Welcoming millions of tourists every year, however, takes its toll: sometimes there is not enough water, the traffic jams can be exasperating, the natural spaces are shrinking, and job positions can be scarce in the winter months. If you can choose, come here in the spring, before the temperatures are too hot and the crowds too big. See more at youtube. Best wishes to Kris Boeckmans, sounded pretty nasty. With wins in the last couple of days to Lotto NL and Trek, this makes IAM the only WT team without a grand tour stage victory. Surely the peloton should have waited for the red jersey yesterday. While they didn’t put the hammer down, they certainly weren’t making it easy for chavez to get back on. Is there something I’m missing or is that rule just not in pro-cycling anymore? Its not like the breakaway wasnt gonna get caught. What I thought. Tinkoff and Sky were together at the front, clearly making pace. Obviously the days of good old rules are gone. Just remember it for the next time one of their leader jersey wearers complain about such things. Silly comment. I didn’t see the other teams stop by the side of the road to wait either. Quite obviously, responsibility is on those who were pacing the peloton. Bad crashes aside, yesterday was another great watch – apart from anything, two ascents of the same climb meant twice down a descent which was gripping stuff. I have a sneaky feeling for a Purito move today but, as mentioned above Steve Cummings has form. He also talked a couple of days ago about having another attack when his legs have recovered, could today be the day for a British stage win? Is this the same Steve Cummings who did a track stand on the final climb the other day? Picking him is more a case of cycling romance over common sense. The Same Steve Cummings who had emptied himself in the break, and took off trying and ultimately realising when a pure climber goes by that he should save his matches for another day! That stage was never his but he again raised the colours of MTN and showed what a decent rider could do. I think he had a gear problem and locked up then but he’s an example of a rider strong enough to power a breakaway and then climb better than average, he’s won small summit finishes too. Other examples include Moreno Moser, Bart de Clercq but we don’t know their state of form / they’re having a quiet time. Yes, I would have to agree with RonDe and Phil B.
Cummins rode very well on the break, but lost 3’12” after completely running out of juice on the last 1km summit climb. If he’s after a stage win, I think that he’d be very cautious looking at today’s finish. Are there any other obvious stages that he may target ? Sagan was more like the incredible hulk after that crash and justifiable. The 200 CHF fine seems like a cruel joke. Surely he could be forgiven for the adrenaline rush? I agree with that. He was put down by a motorbike on a 1st place, it is not acceptable. A crash at that speed made him loose a possible win and as well could have caused serious injuries. 2nd time in a one month time that such an accident happens in spain (gva in the klasica). Is there something to be corrected there or is it just fatality? Don’t forget the Van Avermaet incident also. Sagan had his skin flayed off on his rear upper thigh ! I bet that is going to be sore, especially in that position. As the wound crusts up, it may be broken open again by the constant action of his legs on the crank. Ughhh, nasty that. Inrng, talking of the GVA incident, did anything come of this as BMC were threatening legal action in the immediate aftermath ? Nothing for now. Tinkoff-Saxo are also raising the possibility of legal action but it’s probably just that, a threat rather than something they’ll see through to the end. It seems sad that, even in a bike race, when a motor vehicle takes out a cyclist, the cyclist is more likely to get punished for his reaction. Seems like jasper stuyen had a broken scaphoid when winning yesterday and he won’t be able to start today. Incredible to get a 1st pro win in these conditions. For today’s win my pick is purito. Stuyven is out with the broken bone. Looking at the photos from yesterday he seemed happy on the podium twisting open the champagne cork etc but of course with a broken hand he can’t ride. Peter Sagan is out too. Saw a picture of him with a mummyfied arm yesterday evening. On sagan, just refer to my comment above. Incidents happen, but 2 times in a month in the same country should lead to having some thoughts on this. I think I am increasingly no friend of these kind of stages. In cycling everybody seems to be obsessed with “a narrative”, yet this Vuelta doesn’t feel like one race to me (till now). It feels like single race days, solely with the purpose of a spectacle. There’s nothing wrong with that, I guess, but the overall narrative of a race, that runs over three weeks, is lost a bit this way (again till now). Plus I think these kind of stages produce more crashes and race incidents than stages, where you have to have a plan the whole day and where not everything is concentrated on the finish. I am sure there are many, who prefer these kind of stages, but I don’t like them. Remember it’s only the first week still, we’ve yet to get to the high mountains. its quite obvious how things will play out as the route doesnt really offer a wide variety of tactical opportunities, it will be a final climb Thing. The organiserswill have their accurately planned firework towards the finish. i as spectator just ask myself why should i watch the other 165 kms? Maybe we see a big change happening right in front of us: Maybe they don’t expect us to watch the whole stage at all. Maybe the race organisers really aim only for 1 hour tv fireworks in the future and the rest is for the local people watching alongside the street. To me this is a horrible thought, it would be a totally different sport, but with the Velon-ideas and with tv being now the one only purpose of riding races, it was obvious that the dynamics of racing would change sooner or later. We will see where this leads to. Btw: The fate of TTs is another part of that tv-puzzle. Personally I just love them and I think, they really lend themselves for great tv – if you just would put some thought and love into it, because the difference to normal stages is, that TTs got to be told, while normal stages somehow tell themselves. And there the usual bad tv production of cycling gets exposed: just pointing the camera on something doesn’t work in this case. Other sports show us, how a TT could be made into great tv, but rather than stepping up, putting some thought and money into it, cycling goes the easiest, fastest and cheapest way and so the TTs seem to be on the road of extinction. Change is something natural and good, it isn’t the changing of the racing in itself, that’s bothering me, it is more the nature of the changes that I don’t like much. A grand tour of single race days isn’t necessarily a bad thing – once it became clear certain (personal) favourites weren’t going to feature in the Tour, that’s just how I watched it. By contrast, the Giro was definitely an enjoyable 3 week narrative. You’ve just got to get your enjoyment out of these races however you see best. I think the Vuelta has found some identity with these steep finishes – it is difficult due to Spanish geography to rival in terms routes the Giro or the Tour. It is clear that this makes stages’ scenarios quite boring until the last kilometers, but it makes changes in GC possible in more days than simply in the TT and in the mountains. Remember for instance the Purito/Kontador Vuelta where each of those summit finishes were highly disputed. Even in a stage finish in Barcelona, Kontador attacked in the hill of Montjuic and Purito responded by escaping with Gilbert. This year it is unfortunately not so (I think it is due to the fact that most favourites have the Tour in their legs), but the material is there. I defend the idea of every GT having some sort of different identity, but the problem with what we’re seeing with the Vuelta recently is that the course is a bit monotonous, that is, mainly one-key. Too many stages are more of the same. In fact, the Tour or the Giro do *not* shape their identity with a lot of carbon-copy stages, it’s more like a sum of elements with a coherent result (well, one could argue that Vuelta’s identity includes carbon-copy… but that wouldn’t be that fine, either). What is more, the peculiar kind of stage the Vuelta decided to repeat again and again (final monoclimb) has some inherent problems, at least IMHO: without much difficulty before the finish, it’s very hard to devise any team strategy to provide some advantage to your captain or to force strategic pressure on other teams. I believe that cycling shouldn’t be just “let’s see who climbs faster today”, merely depending on general-and-daily form: you should be prompted to “build up your own luck” using strategy and team tactics. On the contrary, such stages do favour volatile, contingent values (hence the “unpredictability”: but it’s like *artificial* & *superficial*, not the result of an in-depth contest) while depressing other important aspects of the sport, namely – amongst others – strategic abilities and the “fondo”. Hope we’ll see some really great action in those two or three stages which do allow that. +1 A novel formula is one thing, but it’s not so novel when repeated over and over. I thought I’d tuned in to see a repeat of yesterday’s stage for awhile this morning before realizing it was live coverage. I’m having a tough time “getting into” this race. Might be the annoying Eurosport guy’s constant and often incoherent commentary (though Sean Kelly gets to offset it a bit with intelligent comments) vs the Italian-language commentary I enjoy while watching the Giro and Tour on Italian TV? That’s of course not the Vuelta’s fault, but mine for being in the USA at present. Maybe it’s time to look for a pirate feed with Italian commentary? We used to pay for RAI International via cable/satellite for race coverage, but dropped it when they stopped showing much cycling. Believe me, I would prefer to see the same show as in the Giro this year for instance… And I agree on the fact that the Vuelta has been boring so far. The point I try to make (sorry for my bad english) is that Spanish geography is not the french one nor the italian one (probably the best suited for GT action). I think that trying to mimic the Giro or the Tour in terms of route would result in a sort of sad copy paste: instead of flat green country side, falt desertic “meseta”; instead of the Alps, the spanish pyrenees or the sierra near madrid. This said, steep finishes as yesterday’s have the merit of returning (not always but likely) a great show, even if it lasts only for 12 minutes and all the prior was as boring as a eastern procession. And the succession of them is something that is becoming specific of the Vuelta, that gives her identity – a bit like the mur de huy to the flèche wallone or something like that. I’ve always been a Vuelta fan, and I had been quite saddened by the way thing started to go at the beginning of the years 2000s; that is, merely an internal affair, pretty much like the Giro (but with a little more doping, may I dare to say 😉 )… probably, just like in the Giro’s case, as a side effect of the Armstrong Tour-centric era (that’s something about which those “fans” who think that, doping aside, Armstrong was “good for the sport” should spend a couple of thoughts). However, things started to move on and from 2005 on we started to have some really good editions, with a fine course, too, at least IMHO. Vuelta-specific enough, without huge time differences, with a tight contest all the way to the last stages. Maybe there were a bit too many sprinters’ stages, but it was something quite general among all GTs at the time. And you had steep, short climbs, too. It’s only in the last 3 or 4 years that the course has started to get kind of monomaniac, for my taste at least. I felt that the Vuelta already had its proper taste even before, I didn’t perceive it as a “bad copy”. I must add that it’s often a subtle balance: maybe it would have been enough to add a mountain stage (not the monoclimb type…) in the last week to look at it more favourably. Or even to have just a monoclimb more after the last rest day, but… not two monoclimb out of three in the decisive tryptich. Make it a downhill finish, if you wish. With that limited a change, I’d have looked on the first half of the race under a different light, even if the first week remains sort of a low-key moment. It must also be said that TV audience data apparently do support the organisers’ decisions, since they got very good again precisely from 2012 on, after a 4 years drought. Yet I wonder if that does really depend on the course, given that cycling audience is clearly on the rise for the Tour and the Giro, too. These motorcycle incidents are beginning to make the sport look like Wacky races. Best wishes to Kris Boeckmans he will need it in recovery. The Sagan incident shouldn’t happen in sports. How can the UCI claim they value rider safety when one of the biggest stars gets knocked out of a grand tour. This type of incident seems to be happening more and more. GVA at San sebastion. Fulsang at the tour. Cycling is dangerous enough (thoughts going out to Boekman). On the tv, it looked like there was a drop into eternity over that edge, and Rojas had slid under the crash barrier and wasn’t about to stop…! Someone needs to remind Tom Dumoulin that heavy time trialists arent allowed to climb like that. How heavy is he actually? I wonder if Froome is really that light. I’m 171cm, skinny with no great muscle in my upper body, flat stomach and I’m 62kg. I could get down to 60kg maybe 59 if I really tried hard but he’s 15cm taller with bigger thighs and only 4kg more! I don’t believe it. Well if that’s heavy..I am 186cm and 74kg but never thought of myself as heavy – skinny yes, no paunch etc. So I have to loose a bit more then? Body composition is a bit more complex than that. You may know how much your bones and organs weigh (in case you have been to such a test) but you certainly don’t know Chris Froome’s (unless you have some inside information). With less riders around (or right behind), the number of riders in risk of being affected by such incidents decreases… exponentially. The loss of local races implies that (unless a WT full international staff is deployed and reserved exclusive access for technical support, press, photos and the likes, being maybe also involved in managing road closure and control over fans) we’ll have on the road more and more moto riders, drivers and assorted volunteers who haven’t got the due experience. Not every accident depends on these factors, of course, but some recent cases do. Same could be said about a more frivolous subject (not that frivolous in business terms) as TV production. Note that I’m not suggesting that the implementation of a whole moving circus would be the ideal solution: I’m just underlining a contradiction of the present situation, that is, a sport which wants to go global, cutting – or letting dry out – the brushwood (or grassroots?) of lesser, local… definitely *unprofitable* races, forgetting along the way the function that those same race hold within the system as a whole. Direct profit tends to eclipse a good deal of other *values*, which, in fact, do have their monetary consequences, too. Cycling is not only about cyclists and teams and organisers and the UCI, a lot of other peoples are required to do some work (not always but very often for free – that’s not the point, anyway) to have the show going on, and they must be able to do that work, and they must have learnt how to do that – which usually happens only through practice – and so on. Throwing money in those *unprofitable* parts of the sport should be a priority both for the UCI and for big organisers. I acknowledge that they’ve done so in the recent past, still it’s sort of a sporadic, emergency-driven attitude, while it should become a long term plan: that little “extra” money which could maybe be shared (and which would be utterly irrelevant if shared with the teams, because of the already too big budgets of many of the latter), would prove precious for many local/secundary races which could survive with just a little support. Anybody have Tom in the office pool?